A striking sculpture that challenges the perceptions of disability in society was unveiled earlier this month outside Liverpool Parish Church, also known as St Nick’s. The installation, Gold Lamé, originally commissioned by DaDaFest, is by disabled sculptor and artist Tony Heaton and will occupy The Liverpool Plinth, an empty platform overlooking Chapel Street and the waterfront, for the next 12 months. Gold Lamé is based on the famous Invacar – a small, blue, one-seater vehicle given to disabled people during the 1960s and 1970s. 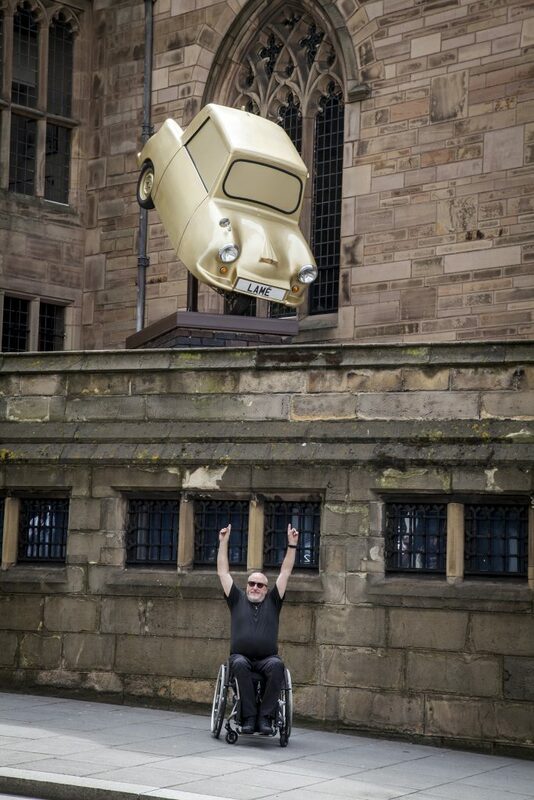 Sprayed gold and suspended vertically above the plinth, the sculpture reclaims the word lame and confronts negative stereotyping of disabled people the vehicle represented. The project is the result of a collaboration between Liverpool BID Company and Liverpool Parish Church who commissioned city gallery and art organisation, dot-art, to showcase sculptors in the north. “The idea behind this project feeds into some of the core aims of Liverpool BID Company – in this case, to bring public art to the heart of the Commercial District BID, to attract footfall and encourage more locals and visitors to use the businesses we represent here. Gold Lamé is the first work for Commercial District that fulfils one of the pledges in the BID’s business plan to create a public art programme that will serve to enrich the experience of those visiting and working in the area. The Liverpool Plinth will host a new sculpture every 12 months. As well as the fantastic exposure and publicity given to the artist and their work, they also receive a £1,000 prize! Gold Lamé was chosen by a selection panel with Bill Addy, Lucy Byrne, The Revd Dr Crispin Pailing, and representatives from Liverpool City Council’s public art office, the Bluecoat, and church archdiocese.